COMMANDING the plot lines of Hollywood films, covers of magazines and reams of newsprint, the contest between artificial intelligence (AI) and mankind draws much attention. Doomsayers warn that AI could eradicate jobs, break laws and start wars. But such predictions concern the distant future. 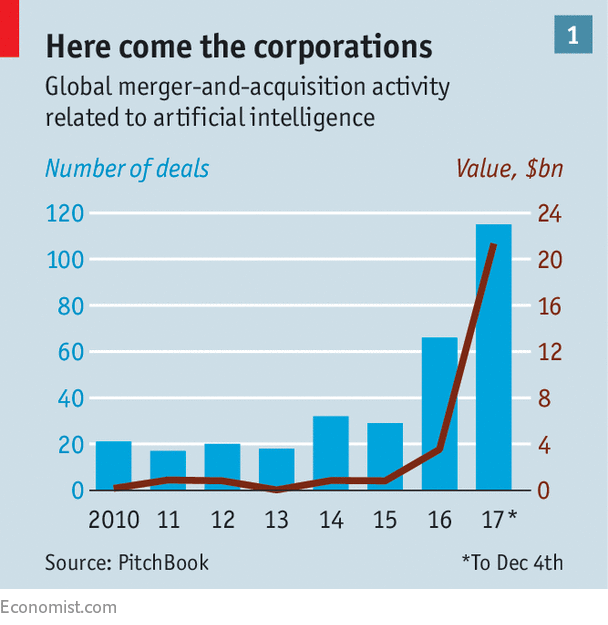 The competition today is not between humans and machines but among the world’s technology giants, which are investing feverishly to get a lead over each other in AI. Job fairs now resemble frantic “Thanksgiving Black Friday sales at Walmart”, says Andrew Moore, dean of Carnegie Mellon University’s (CMU) school of computer science, a pioneering institution in AI (whose robotics department was famously plundered by Uber in 2015). Academic conferences, such as this week’s Neural Information Processing Systems in Long Beach, California, double up as places to shop for talent. The best recruiters are academia’s AI celebrities: people like Yann LeCun of Facebook and Geoffrey Hinton of Google—both former professors who keep a university affiliation—can attract others to work alongside them. Proprietary data can also serve as a draw, if the huge salaries are not enough. The intense battle for talent may force secretive companies to become more open. “If you tell them, ‘come work with us but you can’t tell anyone what you’re working on’, then they won’t come because you’ll be killing their career,” explains Mr LeCun, who leads Facebook’s AI research lab. This trade-off between secrecy and the need to attract people also applies to the Chinese giants, which are trying to establish Western outposts and hire American researchers. Baidu has opened two research labs with an AI focus in Silicon Valley, in 2013 and this year. 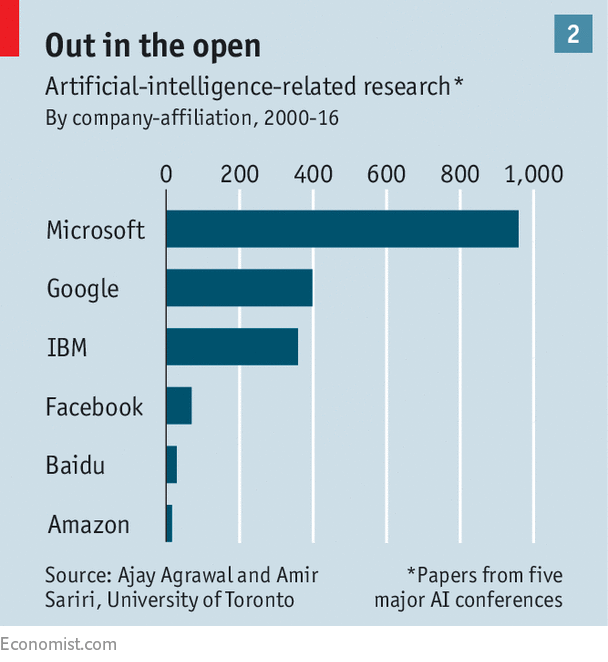 Western AI researchers rate them highly but prefer to work for the American giants, in part due to their relative transparency. The advantages of AI are most visible in firms’ predictions of what users want. Automated recommendations and suggestions are responsible for around three-quarters of what people watch on Netflix, for example, and more than a third of what people buy on Amazon. Facebook, which owns the popular app Instagram, uses machine learning to recognise the content of posts, photos and videos and display relevant ones to users, as well as filter out spam. In the past it ranked posts chronologically, but serving up posts and ads by relevance keeps users more engaged. Artificial intelligence is also being applied in the corporate world. David Kenny, the boss of Watson, IBM’s AI platform, predicts that there will be “two AIs”: companies that profit from offering AI-infused services to consumers and others which offer them to businesses. 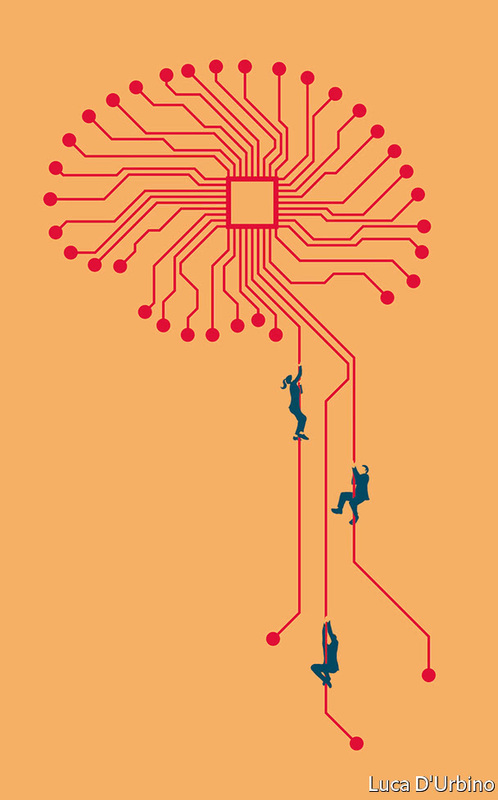 In practice, the two worlds meet because of the tech giants’ cloud-computing arms. Providers are competing to use AI as a way to differentiate their offerings and lock in customers. The three largest—Amazon Web Services, Microsoft’s Azure and Google Cloud—offer application-programming interfaces (APIs) that provide machine-learning capabilities to other companies. Microsoft’s cloud offering, Azure, for example, helped Uber build a verification tool that asks drivers to take a selfie to confirm their identities when they work. Google Cloud offers a “jobs API”, which helps companies match jobseekers with the best positions. Whither the Multilateral Trading System? BRUSSELS – Free trade seems to have few supporters these days. Though actual trade volumes are recovering from the post-crisis recession and drop in commodity prices, “globalization” has become increasingly contentious, as exemplified by the election of US President Donald Trump on the back of a promise to rip up international agreements and get tough on trade partners. What does this mean for the future of the rules-based trading system? As Japan and Europe recovered from World War II – with the latter getting an added boost from economic integration – America’s lead began to dwindle, and by the 1970s and 1980s, the US was sharing power over the world’s trade agenda with Europe. Nonetheless, because the US and Europe share so many common interests, they generally adhered to a cooperative approach. It was not until imports began to overwhelm a growing number of industries in the US, fueling the emergence of large and persistent external deficits, that the country’s trade policy became more defensive, creating friction with many of its partners. Yet, even then, US leaders understood the value of the liberal multilateral trading system, and supported the establishment, in 1995, of the World Trade Organization as the successor to the General Agreement on Tariffs and Trade. The WTO’s creation amounted to a major step forward, as it addressed not just tariffs, but also other trade barriers, including indirect barriers arising from domestic regulations. Given the complexity of assessing how domestic regulations might impede trade, especially compared to judging whether a tariff has been correctly applied, the WTO needed effective dispute-settlement mechanisms, with members agreeing to binding arbitration. The system worked, because its major members recognized the legitimacy of independent panels, even if they sometimes deliver politically inconvenient judgments. Yet this recognition is now increasingly in doubt. Consider what type of economy would support a rules-based system. After WWII, the US supported such a system, because of its unassailable economic supremacy. An open rules-based system would also be highly appealing in a world comprising only small countries, none of which could hope to gain by relying on its relative economic power. Things become more complicated when the global economy includes a small number of economies of similar size, larger than the small economies from the previous example, but not large enough to dominate the system alone. That is the scenario the Nobel laureate economist Paul Krugman considered in a 1989 paper on bilateralism, in which he reported that a world consisting of three major trading blocs constitutes the worst constellation for trade, as a lack of explicit cooperation among all three would lead to increasing trade barriers. Unfortunately, this is exactly the situation in which the global economy finds itself today. There are three dominant economies or trading blocs – China, the European Union, and the US – with very similar trade volumes (exports plus imports) of around $4 trillion each. (Japan, which was a strong contender 25 years ago, now has a much smaller trade volume.) Together, the G3 economies account for 40% of world trade and 45% of global GDP. With economic power distributed in this way, explicit cooperation by all three actors is crucial. Yet there are compelling reasons why they would be reticent to pursue such cooperation. Because the US is now self-sufficient in energy, it needs to export fewer manufactured goods than industrialized countries with no domestic energy resources. 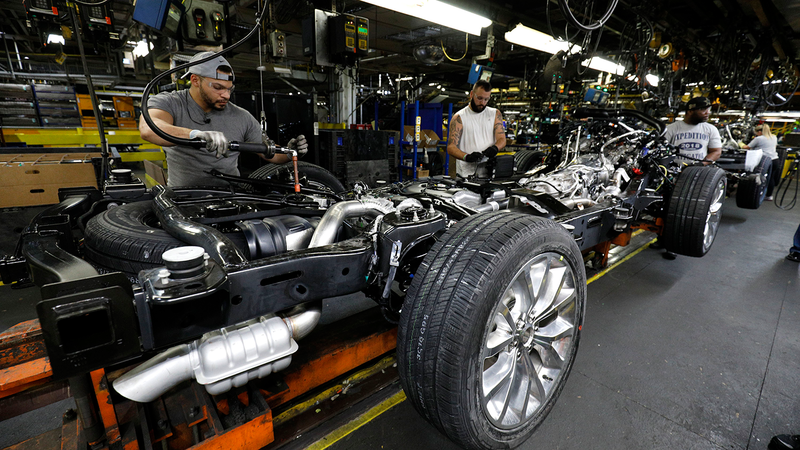 Annual US exports of manufactured goods thus now amount to only about $1 trillion annually – significantly less than both the EU and China, which export almost twice as much in manufactured goods, despite having somewhat smaller economies. To be sure, Trump is unlikely to start an outright trade war, because any US tariff would harm the interests of the country’s largest companies, which have invested huge sums in production facilities abroad. Yet no individual firm will be willing to give up much of its political capital to defend the rules-based system, either, because it would have to bear the losses, while its competitors shared the gains. The same goes for the G3 trading blocs: if the EU expends political capital to stop the US from undermining WTO mechanisms, China (and the rest of world) will reap most of the gains. That dynamic goes some way toward explaining why China’s leaders, despite having proclaimed their support for the multilateral rules-based trading system, haven’t taken concrete action to reinforce it. Their reticence is probably intensified by the assumption that, within the current generation, their country will dominate the global economy; at that point, they might no longer want to be bound by somebody else’s rules. It does not help matters that the Communist Party of China has recently been empowered even further in all areas of the economy, with all major firms now having to accept a CPC representative on their board. It is difficult to see how a dominant economic power governed by a single party – especially one with such extensive control over the economy – would accept the primacy of international rules and procedures over domestic considerations. The conclusion is clear. The world should prepare itself for the erosion of the rules-based trading system enshrined in the WTO. Knowledge@Wharton: This is the biggest tax bill in 30 years. It’s been pushed through with a lot of details left out, which has been confusing for many. The public has had a tough time understanding what’s in it. What’s more, there’s a House version, a Senate version and ideas are being floated for a compromised reconciliation version. Still, some broad outlines at least are in focus. On one side, critics say that tax changes would increase the deficit — the cuts don’t pay for themselves, in other words, and would do little to increase economic growth. On the other side, the claim is the tax changes will boost economic growth, and thus family incomes, cause companies to hire more workers, and overall boost the middle class. What does the model show? We show that by 2027, the GDP will only be about 0.3 to 0.8 percentage points larger. That’s like going from a 2% annual growth rate to a less than 2.1% percent annual growth rate. More importantly, the additional growth that we project is only about one-ninth of the growth that would be required for this tax plan to actually pay for itself. And so we’re very far away from having a tax plan that pays for itself through these macroeconomic effects. I should point out that things can get even worse after 10 years. D.C.’s focus on this 10-year window is very misleading. When you get beyond 10 years you might think, well the tax plan has kind of kicked in a bit more, [there’s] more opportunity for it to get better. It’s actually worse after 10 years. The reason: Since it’s not paying for itself, the debt keeps building up. That debt build-up kicks in even more after 10 years. We predict by 2040 that basically the GDP is unchanged, and in fact it could be a little bit smaller than on their current policy. 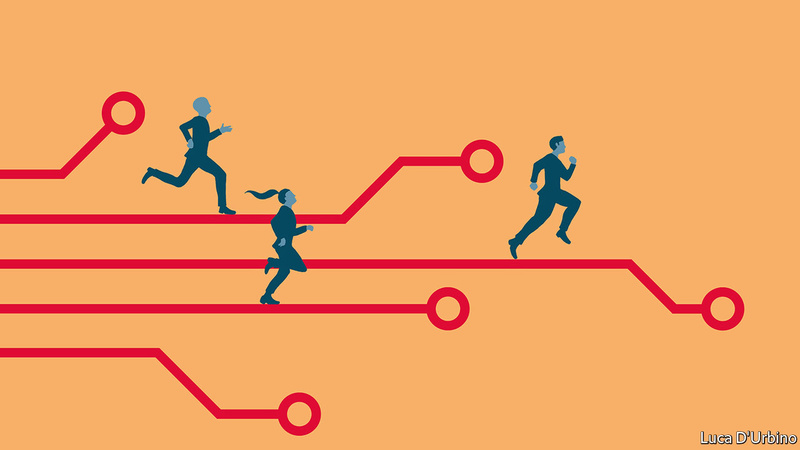 Knowledge@Wharton: What’s the bottom line for business? Smetters: There are a couple of things in there. There’s a reduction of the corporate tax rate. We’ll see what it ends up with. Right now the target is to go from 35% to 20%. It’s unclear if they are going to be able to literally keep it at 20%, because of some of the revenue issues. Especially on the Senate side, there are particular rules — the Byrd Rule — that they have to worry about. But that’s the current target. There is an increase in what’s called expensing. That is to allow companies to depreciate their assets against their tax bill at a quicker rate than they currently are — in fact, to do it all immediately. Of those two effects, economists are much more excited about the expensing approach than cutting rates, simply because expensing focuses on new investments. With both of these plans, however, they have very limited expensing. They only focus on equipment, and then the expense supervisions are only temporary; they only last for a couple of years. Smetters: It depends kind of where you are. The various tax rates will come down, there will be fewer tax brackets. There may or may not be something at the high end still that has a higher tax rate for higher income earners around what we see today. They are still debating some of that. But for most people, the tax rates are going to come down. But there will be a loss of various deductions. On the one hand, the standard deduction is going to go up, so a lot of lower-income people are going to be helped by that. But then for a lot of people living in California, New York, New Jersey, they’re going to be losing likely at least part, if not all, local income and property deductions. It looks like under the current agreement they will be able to still deduct their first $10,000 worth of [taxes], but if you are actually in California or New Jersey or New York, which by the way are blue states that the administration is less sympathetic with — they are going to definitely be paying more. Knowledge@Wharton: For lower- and middle-income groups, the tax brackets will drop a little bit, and they might save a little bit. Is it a material increase and will it matter either to them or to the economy at large? Smetters: No, we’re finding very little impact on the economy at a large — and when we talk about what’s the impact on the person, it really comes down to: Who is that individual? The Wall Street Journal today just launched a simplified version of our tax model. You can go to the Wall Street Journal website. Our actual tax model has hundreds of inputs, but it’s boiled down to just nine inputs in the Wall Street Journal so obviously this is an approximation, it’s simplified. Nonetheless, it captures the salient features of things like state and local deductions, child credit — which is a big one — and things like that. You can go on there and get a guesstimate of what your taxes are today, and what they will be, at least under the House plan right now, and then we’ll do it again with the reconciled bill. Knowledge@Wharton: Some analysts suggest that the tax rule changes strongly favor the top 1% of earners, and especially the top 0.1%. One analysis even notes that in 2027, when individual tax cuts fall away, more than half of the benefits would have gone to the top 1% of income earners. At the same time, the PWBM model shows that under the new tax regime there would be no significant change to the level of progressivity of the tax code. Those earning the most will pay a percentage of total taxes very similar to what they pay today — and for those earning at other levels, it would also be similar. So how does all of that fit together? Smetters: That’s the big issue of trying to convey this to a media that wants sound bites. Generally speaking, unfortunately, in this tax-reform debate, the big picture is how good analysis has taken a back seat. Proponents of tax reform — I used to call them conservatives, but conservatives used to believe in fiscal discipline, that you actually pay for tax cuts like we did in 1986 — are basically making up growth numbers. No legitimate model says, when it’s calibrated to the actual tax plan, that this tax cut is going to pay for itself. But the opponents, I think it’s still safe to call them … liberals, they’re basically also making up numbers. I call it click bait when it comes to distributional impact. Whether it’s the 1% or the top 10%, they’ll talk about how these guys make more from this tax plan than the bottom 50%. But this of course ignores the fact that the richest 10% in the country are already paying more than 60% of the country’s tax bill to begin with. So when you start with a very progressive tax system, even a proportional change is going to look like it’s the top people that are making out. Well that’s because they, in fact, paid most of it to begin with. What happens is that for the left, the click bait is who actually gets most of the benefit from this tax bill, ignoring who actually pays the taxes to begin with. And we just don’t think that’s a legitimate analysis. One simplified number that’s still legitimate to look at is tax shares. And for that you simply ask: What is the share of taxes that are being paid by these different income groups, and how does that change? Well, one of the important findings of our model is the share of taxes paid by the top 1%, which is more than a quarter of the nation’s taxes right now, and the top 10%, which pays more than 60% of the nation’s taxes — those shares even under current law will go up over time. And the reason why is the different features of the tax code known as “real bracket creep” and some other features that will actually increase their shares over time. For the most part, what this tax plan does on the distributional side, it kind of resets it, such that by 2040 the top 1%, the top 10% are going to basically have the tax shares that they have today. Yes they will win for a little bit — it’s not going to be perfectly smooth — but for the most part, it’s just basically preserving the tax shares over time. Knowledge@Wharton: For those who thought this might do something for the issue of income inequality, it doesn’t change it one way or the other. Smetters: Yes, this is basically a tax plan where the growth numbers aren’t great … those are embellished by the proponents, and the distributional impacts are greatly embellished by the opponents. This is an embellished debate on both sides. Knowledge@Wharton: Does the model look at wealth measurements? Smetters: Yes. For the most part the increase in wealth by people is fairly proportional to their progress via the tax code. And so it’s not surprising that if you look at the percentage change in wealth, for low income households, 50% of households in the United States have no meaningful savings outside of Social Security for retirement, for example. And so there is very little nudge going on with them; when you give them a tax cut, they immediately spend the money. They are what we called borrowing constrained. So it’s not surprising that those who are not borrowing constrained are going to save more of that money and invest it and so forth. So you definitely get what looks like increase in wealth inequality, but again we’re talking about a smidgen — it’s not a big one. If in fact Congress were really concerned about this, there’s a so-called twofer here in terms of economic growth and even distributional wealth. And that is: Focus less on rate cuts on the corporate side and focus a lot more on expensing of new investment. Cutting rates doesn’t just reward new investment; it rewards all the investments that have already been made and that will be subject to tax. Focusing your deficit dollars much more narrowly on the expensing rewards purely new investment. Expensing is more of a stimulus, and it’s less of a reward to current shareholders. Knowledge@Wharton: Business taxes are to be reduced from 35% to 20%. Will companies bring home a lot of the $2.5 trillion they have kept overseas and take advantage of these lower rates? And if so, how much might they bring home? What are they going to do with it? Are they going to invest it? Are they going to pay down debt, give most of it to shareholders, buy back their own shares, hire more workers? Smetters: It’s unlikely in the long run that we’re going to see big changes. What we’re talking about is more temporary changes. Under both the House and the Senate version of the bill right now, all of those foreign earnings — that $2.5 trillion sitting offshore — would be considered to be automatically repatriated. What that means is tax is due. But it’s a tax due at a special rate; it’s going to be due at 10%. And even then it can be paid over many years — it’s not all going to be due at once. So under current law the big issue is that those earnings are not subject to the U.S. corporate tax until they are repatriated and brought back into the country. And there are some Clinton-era loopholes that allowed for that exploitation. So these plans were basically to say all of that is now repatriated automatically regardless of where it is. You pay a 10% rate, we would give you many years — likely a decade to pay that 10% rate. So we will see some money coming back that artificially was sitting offshore. What will happen with that money? That is a big debate that’s going on now. But it’s likely that some of it will be paid out in higher dividends, some of it will be paid out in stock repurchases and some of it will likely be invested. We don’t think the investment channel is going to be nearly as big as some people will say, and the reason why is that there are already some ways of clever financing. For example, Microsoft and a lot of the other companies that have a lot of big money offshore, they’re smart, and they don’t pay a dividend with that offshore money because that would be tax inefficient. They actually float new debt to pay a dividend already today. And so they’re not really constrained right now in making the investments that they otherwise would want to make in the United States. So for the most part, this repatriation — most of that money is going to go to shareholders in the form of dividends and repurchases. The real issue is: What’s going to happen in the long run? In the long run, after this one-time reset, you’re still going to have the same problem. Yes, the U.S. corporate rate will be lower. But it’s not going to be low enough to stop this problem on new money earned offshore because it’s still going to be cheaper to do the double-IRS /Dutch sandwich inversion and all of the other fancy techniques. And by the way, these tax bills as currently written have enormous loopholes, tax-avoidance schemes. They are kind of aware of it. They’re trying to rush and fix some of these things, but it’s almost impossible to figure this all out before the end of the year. You really need months of talking with tax attorneys to figure out all of these things. Knowledge@Wharton: So it could be law easily before we really have any serious idea of what the results will be? Knowledge@Wharton: Two questions about what we’re talking about there. One is: Corporate debt levels are pretty high right now. Do you think this will lead to a pay down of some of that debt since they won’t be financing themselves in quite the same way? Smetters: Corporate debt levels are high in countries like ours that allow you to deduct the interest on that debt. It’s completely tax arbitrage. It’s not that companies are suffering for capital to invest and so forth. Sometimes you hear about debt being cheaper than equity. That’s kind of loose language; it’s cheaper because it’s more tax efficient. And so we have this big skew towards debt in the United States. A lot of people don’t realize the corporate debt market in the United States is bigger than the stock market — it’s a huge, huge market — because with over-the-counter trading, it’s not as visible. You don’t see the index like you do the Dow on your newsfeed and so forth. These bills are going to limit some of the interest deductibility — but again that, as I read the tea leaves, will likely be temporary. And so it’s also not completely eliminated. It’s just some limitation. So you should start to see some skew away from debt just for that reason, but I don’t think it’s going to be dramatically connected to the repatriation issue. Knowledge@Wharton: So in general, do you see a big change in corporate strategy or tactics for these big multinationals and how they manage their far-flung empires, because in the end this tax change will be a wash? Smetters: For the first decade it’s going to look like big changes because of this one-time repatriation. But over time, if you are a larger firm, you are still going to be pretty smart in keeping that money offshore. And the reason why that happens is because of this decision that was made to move towards what’s called a territorial tax. And the problem with that is there are some advantages relative to our current tax system — which is known as the worldwide tax system, but it’s not as integrated with the rest of the world the way what’s called a destination tax is integrated, which was part of the 2016 House GOP bill. That destination tax would have created much more integration and removed those distortions for the most part. That was not very popular with Walmart and some other companies that were basically claiming that imports would become more expensive and so forth. There was a lot of misunderstood economics — that’s a debate that economists lost because we didn’t articulate it very well, but nonetheless because of that lack of integration there will still be good tax arbitrage for companies locating offshore. Knowledge@Wharton: What items does the model suggest bring the most benefits to companies and to the economy overall? Smetters: For the most part it is the small move toward expensing on just capital equipment – that did [increase] the speed at which you can do depreciation, but it’s not full expensing. Those are the things that tend to give you the most kick. The reduction in rates is actually much smaller, because hypothetically, if we went to full expensing, then the reduction in rates actually does nothing for new investment, because you’ve already essentially eliminated the tax on new investment. The reduction in rates only rewards existing investments. It’s a complete wealth giveaway at that point. The big power comes from expensing. Those are the big lessons from our model, and these lessons weren’t adhered to. If you really were trying to have a very pro-growth result, you can get big growth if you just went to full expensing of all tangible and intangible capital expenditures — that means capital equipment, structures and so forth. If you went to a really integrated international tax system like a destination-based tax, and you actually — like in 1986 [when the last major tax reform occurred] — paid for the tax reform, you made it basically revenue-neutral on a static basis, that means that on a dynamic basis net of growth you’re actually going to have more revenue. Now why do you actually want to have more revenue? Because we’ve got this massive amount of debt, and this debt is increasing as far as the eye can see. We’re almost approaching World War II levels of debt. We’re not quite there yet, but we’re getting there. But with World War II that debt came way down afterwards — the war was over, the economy had grown, we were rebuilding the world, and so forth. Now, as far as the eye can see, we’re on this escalating debt path. And by being able to pay some of that down, using the dynamic effects to pay some of that down, that’s where you get a nice big kick as well to stimulate capital investment. So those are the real three main ingredients: full expensing, integrated international tax with a destination-based tax, and then being revenue-neutral on a static basis and using the additional growth to pay down debt. Knowledge@Wharton: None of which are in the current legislation. Smetters: Well, a smidgen of the expensing, but not the other stuff, that’s right. Knowledge@Wharton: The White House Council of Economic Advisors says that corporate tax reform will increase the average family income $4,000-$9,000 a year. The PWBM suggests only a small amount of increase in labor income and GDP. How do you see the two reconciling or not reconciling? In fact, my previous academic work is some of the most cited for these pro-growth effects of tax reform. But all of those models are looking at very stylized tax changes that are revenue-neutral, that incorporate those things that I just talked about, that are very pro-growth. Any model that has actually looked at this current tax bill, not some stylized example of this academic work that’s been done in the past, has not found anything close to it paying for itself. Even models I disagree with, that ignore the debt effects, have not found that impact. And so when the Council of Economic Advisors [projected] a $4,000-$9,000 increase, that is based on — it turns out — not just really stylized models, but also some studies that weren’t even focused on the federal tax system. They were focused on arbitrage between some state tax systems. And so they are political statements; no credible model produces that result. Knowledge@Wharton: What are some of the most important things for businesses to know about this, and for consumers to know about all of this? Smetters: The bottom line is, don’t get too excited. The growth effects are going to be modest. For consumers, individual tax payers, it really comes down to your details. Where do you live? And what is your income range? How many kids you have? For businesses — yes, you’re going to have lower rates; you will have this one-time repatriation, especially for the larger businesses. [There will be] some exploitation of — I mean that in a positive way — increasing investment through expensing and so forth. The biggest concern, generally, that I have on the business side is the big winners of this are going to be tax lawyers. Right now there are just massive loopholes in the Senate version, which literally is part handwritten. You can see the bill, and there are parts of it that was voted on that were handwritten, to get some votes at the last minute. So, it has huge problems that even the Republicans acknowledge – big problems and big loopholes. The biggest immediate concern I have is that between now and Christmas, we’re trying to give a Christmas gift to the White House of getting this tax bill done, and it is just not enough time to figure out all of these loopholes. And so there might be enormous unintended consequences. The corporate AMT [alternative minimum tax] is an example here. It wipes out all of the value of the development and research credit, and some other credits. It’s just a mistake. Republicans acknowledged it was a mistake in the Senate bill. And then there’s all of this tax arbitrage – tax-avoidance schemes, tax-abuse schemes, and so forth. Smetters: There are transactions that you can do, this gets really in the weeds, but using what’s called foreign related parties, which are basically not necessarily a fully owned subsidiary, but anything that you have a 25% or more interest in. There are ways of basically making payments to them and they give you a loan back, and it’s going to avoid the potential for what’s called base erosion in these schemes. And normally how this works is, like in 1986, you get all of the tax lawyers, all of the experts — you have a process incorporating all of that…. Just the fast-tracked [nature] of this is what is very perplexing for everybody. Knowledge@Wharton: It sounds, based on these potential enormous loopholes that you mentioned, that if anything your estimates for the deficit could be much higher? Smetters: We incorporate pretty sizeable, what’s called income shifting and reclassification. Those are the big ones where some empirical studies have calculated what’s called elasticity, to figure out how much of that is going on. We have those in our estimates; in fact, the PWBM score for the Senate plan, when the JCT [Congress’s nonpartisan Joint Committee on Taxation] came out with their dynamic score a couple of weeks later, only differed by $3 billion over 10 years. We’re talking about a $3 trillion annual deficit; we’re talking about revenue loss of more than a trillion dollars over 10 years. We got there in different ways. But on the House side we differed quite a bit, and the reason why is because we believe that the base erosion is much bigger than what the JCT has accounted for. They also allow for what is called income shift, and that’s across periods, that income reclassification, that exploits differences in tax rates even within a period. They allow for that — we believe they undercounted it. At the PWBM we have the person who was the [Treasury Department’s] Office of Tax Analysis’s expert on income shifting and pass-throughs and income reclassification — he’s now with us full time. He’s generally considered the leading expert in this area. And we believe that the official Congressional numbers on this are underestimating that. Back to your point: If anything we are still underestimating [the amount of deficit increase] because we are just talking about income shift and reclassification. There are potentially even much bigger schemes here that just take that stuff, put them on steroids — clever schemes that lawyers will figure out that we haven’t even incorporated yet. Knowledge@Wharton: So the unknowns are probably going to result in an even higher deficit? Smetters: Yes. If anything, all of the assumptions that we make are pro-growth. That’s the irony about it. I could go into a whole list of assumptions that we’re making, that if anything bias us upwards in terms of growth. But nonetheless, the downsides are basically a much bigger potential for deficits. There is nothing in there where we say, okay maybe that will just eat away at the deficit that will have the unintended consequence in the positive direction. We just don’t. Tax lawyers are good at figuring out how to reduce your tax bill, not figuring out how they increase their voluntary tax bill. The irony about this is that the 1986 reform — which economists left and right, across the political spectrum … all basically agree was a good tax act — broadened the base, got rid of a lot of loopholes…. We all pretty much agree that 1986 was a class model kind of tax reform. It simplified a lot of things, was pro-growth, revenue-neutral on a static basis, so you got your growth really kicking in. What this is going to do, at least as currently written … is basically revert to pre-1986, where if you had serious money coming in, you could always figure out how to avoid paying taxes. Investment bubbles must be respected. They do not come from thin air, but rather from a reality that has been misperceived. This is a truth that springs from the most famous bubbles of the past. Internet stocks, canals, railroads and motor cars all had a great future ahead of them when they were at the centre of bubbles. A brief bubble in ethanol in 2006 grew out of an increasing global preoccupation with climate change and the search for alternatives to fossil fuels. Bubbles in Japan in 1989 and China in 2007 grew out of two of the most extraordinary stories of economic growth in history. In all cases, there was an exciting growth story to be told, but the growth was in the future and impossible to value with any confidence in the present. Greed swamped fear as people saw prices rise. But the reality was positive, just misperceived. So what exactly is the misperception that is driving the mania for bitcoin? And is that misperception diverting money from other assets, and creating what the hedge fund manager Diego Parrilla calls an “anti-bubble” in a new book? Some basic facts for those lucky enough to avoid the excitement: bitcoin is a revolutionary form of digital money that allows transactions on decentralised computer networks. Money resides in your own computer “wallet”, not in a bank’s ledger. It is protected with state of the art cryptography. Since its introduction almost a decade ago, bitcoin has spurred the most impressive burst of entrepreneurial activity since the first wave of investment in the worldwide web. There are now many other cryptocurrencies, while different entrepreneurs are working to expand the concept to contracts and even to journalism. Only the resolutely unimaginative could fail to be excited by the technology. As with the internet two decades ago, its potential to be transformative is evident. But this does not necessarily extend to the price of bitcoin itself. As the dotcom bubble proved, even the most exciting long-term technology can also inflict grievous long-term losses on you if it gets sufficiently overvalued. Bitcoin has already enjoyed two extreme bubbles. During 2013, when it gained almost 5,500 per cent. Now it is doing it again, and causing intense excitement. Wonderful though the technology could well be, there is no possible valuation scheme that would justify raising its price fivefold through the first 11 months of this year, and then another 70 per cent in the last week. Price is following the classic pattern of an investment mania. Why? A big part is that the technology is so exciting. But there is more to this than paying far too much for stock in Cisco Systems, as people did in 2000. It would make sense if this were part of a broader loss of confidence in fiat currencies. Central banks have continued easy monetary policy since the crisis in a bid to prop up asset prices and spark activity. Stocks look blatantly overvalued. Bonds look even more so. Art has never fetched such big prices. The bitcoin is only an absurd appendage to what is already a “bubble in everything”. Thus bitcoin might be seen as a bet against rampant asset price inflation, and an attempt to protect against a forthcoming implosion as higher interest rates finally lead the financial house of cards to collapse. But that does not explain everything. Gold is up about 10 per cent for the year. That is less than the growth in stocks, and it has been falling during the latest overdrive phase in bitcoin. Rather, bitcoin mania can be attributed to broader social conditions. Demand is greatest in the countries of the Pacific Rim, with South Korea, Taiwan, Japan and China all trying to curb extreme interest in trading the currency. Especially in China, demand reflects a distrust in governments, and not just in their currencies. This also seems to be true of demand for bitcoin in the US, where backers seem keen to go far beyond doing without banks or central banks. They seem far more interested in cutting governments out of the equation altogether. If not truly anarchist, the demand for bitcoin reflects a radical and global breakdown of trust in existing institutions. Decentralised technology plainly permits this possibility. But it is horrifying that people find the notion appealing. Computer networks, we now know, are easily attacked. Cryptography helps, but there are weak points when people enter and leave the blockchain system. Thursday brought news of a major theft of bitcoins. In a decade or so, quantum computing may well be able to sweep aside the best current defences. Meanwhile, most governments around the world are democratic and derive their legitimacy from elections. But trust in democracy itself seems so low that putting trust in wholly unelected developers seems more appealing. The bitcoin craze can take its place with the various shocking election results of the last few years as a symptom of a breakdown in trust in western institutions — and also of frustration in Asia with the institutions that have guided growth there.